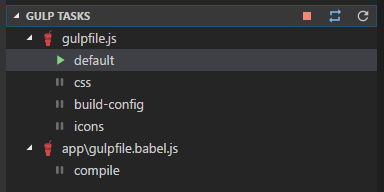 Visual Studio Code>Other>Gulp TasksNew to Visual Studio Code? Get it now. Allows you to visualize and execute gulp tasks found in your workspaces. NOTE: If you are using a multi-root workspace and have a custom filters array in your settings, you may need to add a glob prefix (**) to node_modules and bower_components to avoid errors. This was fixed in v1.1.3 and the below example shows the required values. gulptasks.pattern A glob pattern for gulp file matching. Has a default value of **/gulpfile*.js. gulptasks.filters An array of globs used to include and exclude workspace paths. Has default values of ! **/node_modules/** and !**/bower_components/**. gulptasks.args An array of args to be included when executing gulp commands. Has a default value of empty. gulptasks.output.show An enum value specifying when the output window should auto show. Has a default value of Task Starts. Options are Task Starts, Task Progress, Task Completes, Task Errors and Never. gulptasks.notifications.executed Whether to show notifications for successfully executed tasks. Has a default value of true. gulptasks.notifications.terminated Whether to show notifications for terminated tasks. Has a default value of true. gulptasks.notifications.restarted Whether to show notifications for restarted tasks. Has a default value of true.